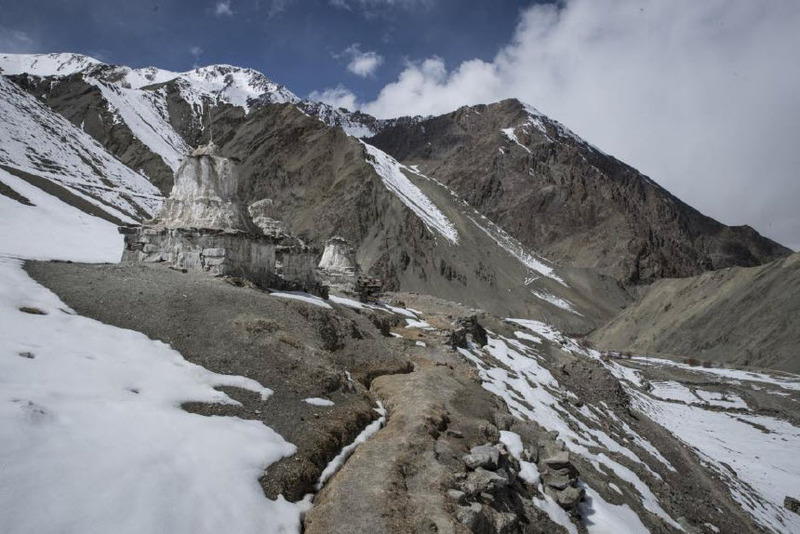 Flying over the snowy giants and the glaciers that isolate Leh and its surrounds from the rest of India is a most dramatic and delightful introduction to the Himalayas. The guests on this trip were everything a guide could ask for: warm, positive, full of laughter and free of expectation… and in my experience these are the kind of guests who get the most rewarding of wildlife encounters. Upon arriving at the Grand Dragon Hotel, I requested that everyone have a good meal, hydrate, and go to bed. Too many people want to explore this beautiful landscape well before their bodies have acclimatized to the altitude, and I asked them to resist this temptation and rest. 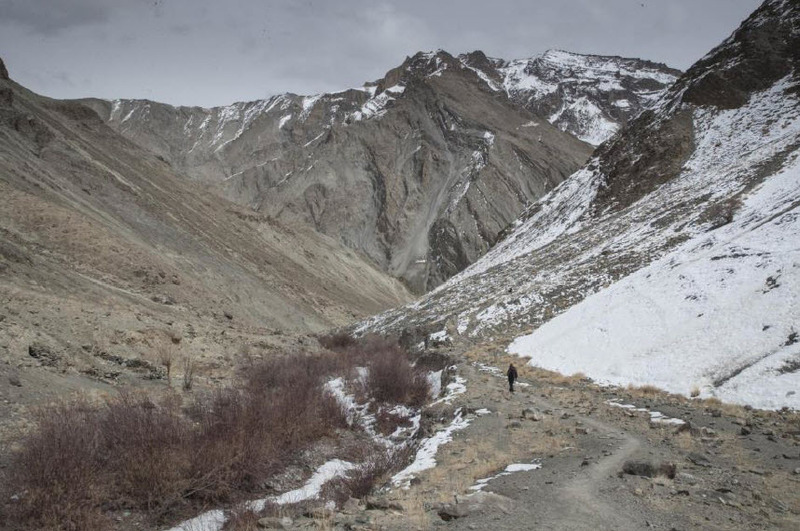 Half an hour after they had gone to their rooms, I woke them up and asked them to ignore what I had just said, get changed, and meet me in the lobby as soon as they could… against all odds Phunchok and our ground team had spotted a snow leopard while having lunch an hour outside of Leh! 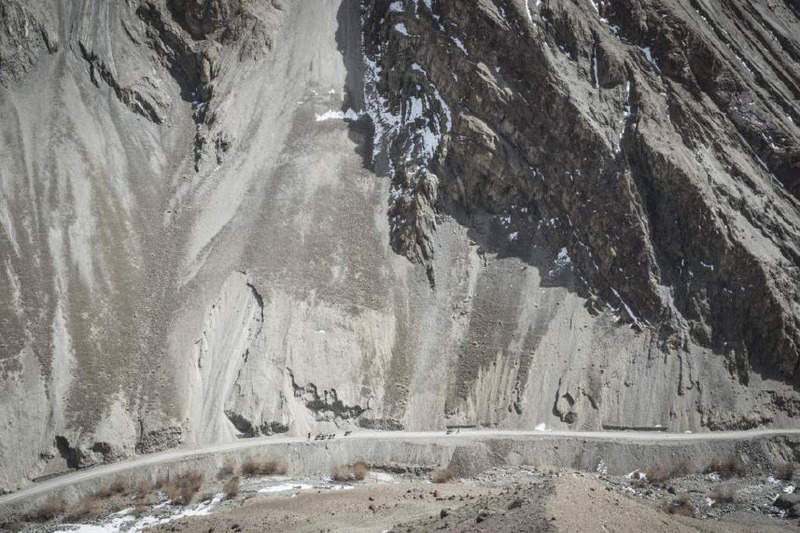 What followed was a thrilling (or terrifying, depending on which side of the vehicle you were on) high-speed ride in a minibus along a network of tiny mountain passes and hairpin bends, with sheer drops, warning hoots and breath-taking views of the Indus and Zanskar Valleys. 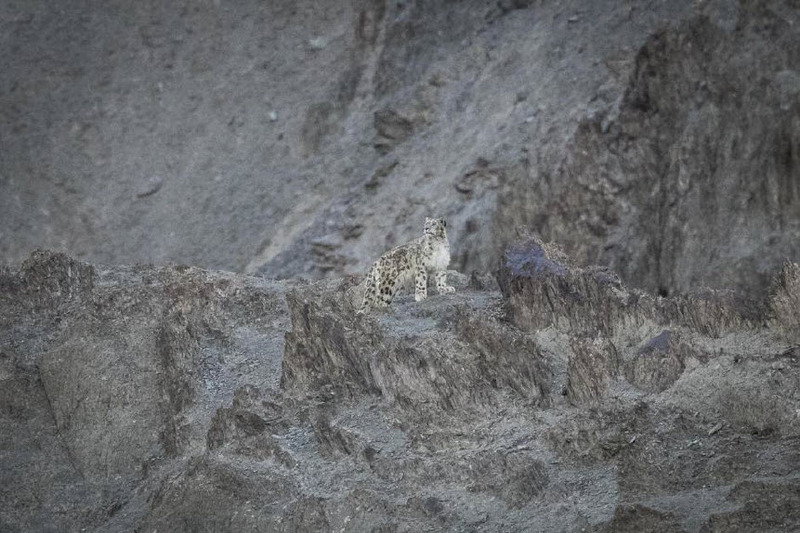 When we joined Phunchok he had a concerned look on his face, fearing it had disappeared, but as the cold seeped into our bones we saw a movement in the scopes… a snow leopard… sighted within hours of arriving in Leh and two days before we were to enter Hemis National Park. It was far away but we all had a clear view, and were hugging each other like long lost friends. We stayed with the great cat for almost two hours and I had the feeling that if this was the only sighting we had this lovely group of people would have been satisfied. Everything from here on in was going to be a bonus. The next day we went to a local market, got some extra supplies in town and visited the majestic Thiksey Monastery and Maitreya the grand Buddha of the future that resides inside. We passed through scores of adobe houses, settled into the altitude and got a taste for the simplistic and beautiful Buddhist lifestyle of the people. Another majestic sunrise at Grand Dragon the following day heralded the beginning of our journey into Hemis. 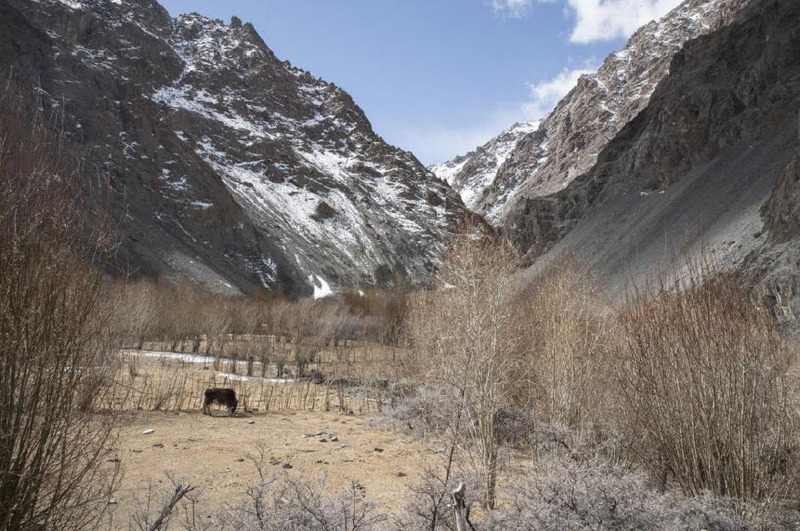 We were lucky to see a herd of Ladakh urial on the way into India’s largest national park. As is custom we spent half an hour in a ritual respecting the guardians of the mountains. There are two rock spires at the entrance to Hemis that remind me of a scene in Lord of the Rings, and here we saw our first blue sheep. It’s hard to describe the feeling of returning to this deep, soulful wilderness. We made it to the base camp where we met our amazing crew and settled into the gentle days of camp life. Flocks of hill pigeons and curious magpies would join us in camp, often stopping by looking for scraps. Golden eagles soared overhead almost daily. One day, one stooped out of the sky and narrowly missed a Himalayan snowcock. We had lammergeiers constantly floating above us daily and there were lots of wolf tracks and droppings. This year blue sheep dotted the cliffs in abundance. A large-eared pika scrabbled from its stony hideout, and every morning chukar partridge slid awkwardly across the frozen river. At night we caught the occasional glimpse of the Tibetan red fox and were spell bound by the stars. Photographically the landscape is incredible. 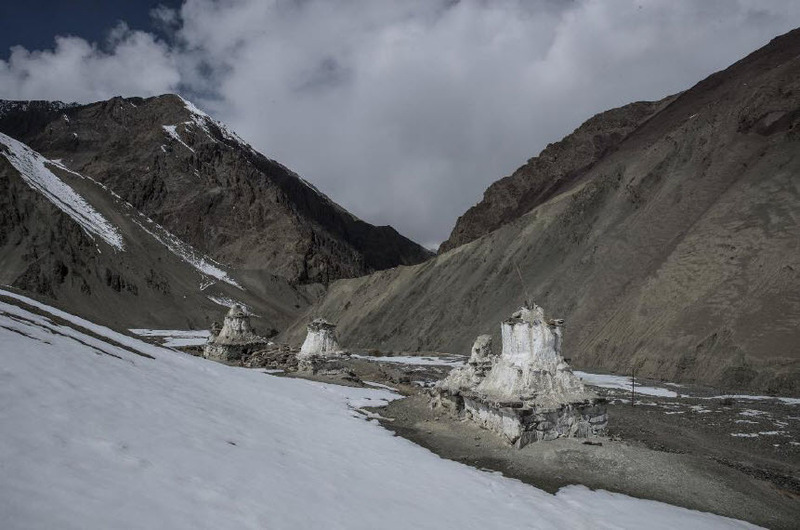 Many of the scenes, like the dzo, cow-yak hybrids, plodding their way past dilapidated Buddhist stupas feel like something out of a star wars set. We visited the Rhumbak hamlet and while walking along the frozen river we found a pair of Eurasian Eagle-owls nesting in the gorge. 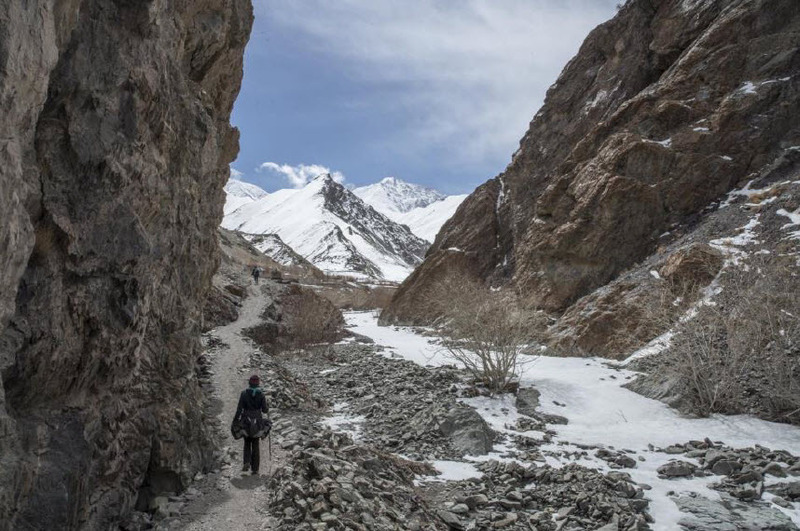 I was distressed to see that the government are continuing to blast a road up to the hamlet and I wonder what impact this might have on snow leopard and other wildlife in the years to come. Certainly I think the time to come and try and see these cats is now. We shared a body-warming cup of chai a very heart-warming cultural exchange with our spotter Nawang’s family. Our other spotter I had not worked with before. His name is Sonam, and had on previous trips worked as a chef. I remembered a trip in 2013 when the only two sightings had been spotted by a chef in camp while everyone else was out. I put two and two together and realised this was the same Sonam. 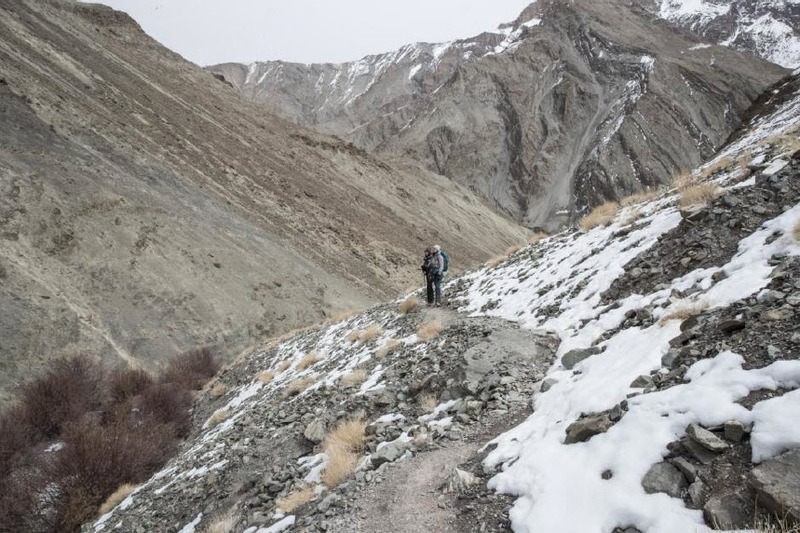 I was incredibly impressed by his sharp eyes but more by his determination and belief that we were going to find a snow leopard in what often seems like an impossibility in this vast place. He was up at the break of light and was very often the last person to put his scope away even when we were having lunch breaks. His patience was a beautiful thing to witness. At lunch time on day five we were feasting in the tent and heard a commotion outside. Sonam had found what he thought was a snow leopard. Choking down our food we shakily got scopes on what was essentially a tuft of hair not too far from our camp. Movement! But there was something strange about the size… another tuft of hair that couldn’t belong to the same cat. Two snow leopards! No, three! A mother with two sub-adults, and the first time these sub-adults had been seen! We pulled up camp chairs and spent the afternoon watching them until at dusk they finally rose and sauntered down the mountainside and into the valley. 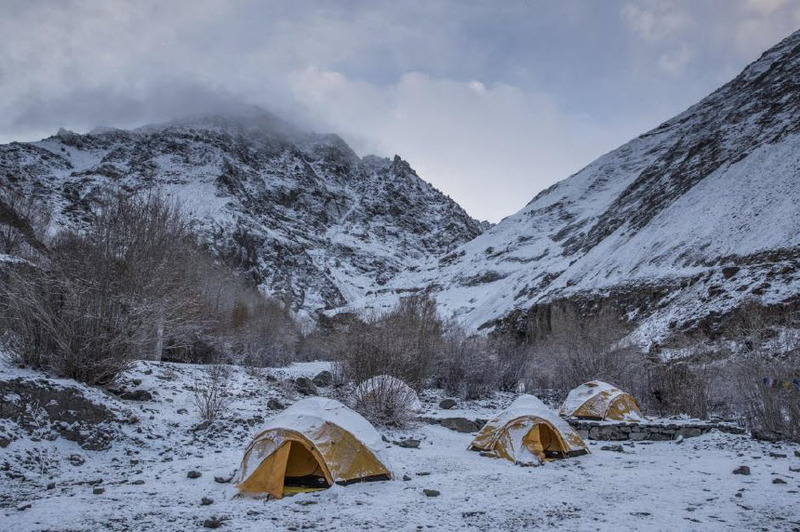 One day we woke to a snowy wonderland, there was child-like delight amongst us as we brushed the white from our tents. 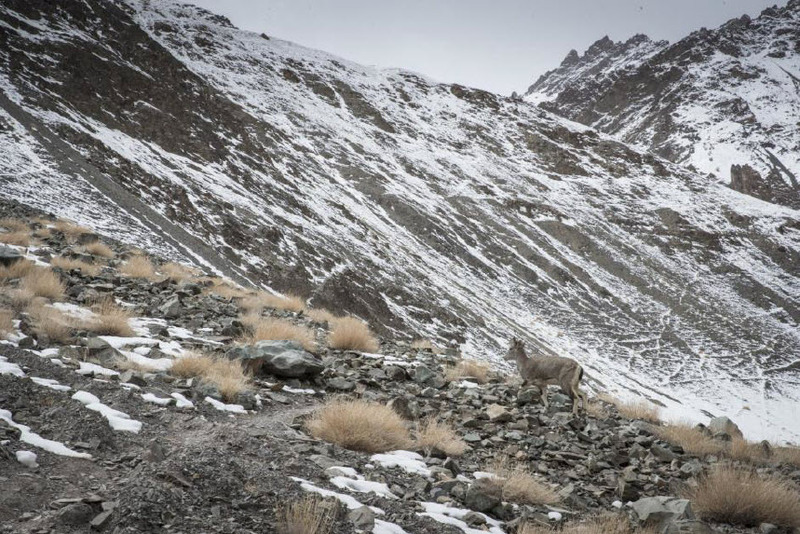 The snow can be a blessing once it clears: it can make tracking a little easier and also covers up the vegetation which brings the blue sheep (and thus the snow leopards) down to lower altitudes. On the last day we did another walk up to the Rhumbak valley, it was an incredible day bathed in sunshine. We felt so lucky we had seen so much and simply enjoyed our last day in the peace and solitude of the mountains. We essentially had the national park to ourselves, the few locals from Rhumbak were the only other humans. 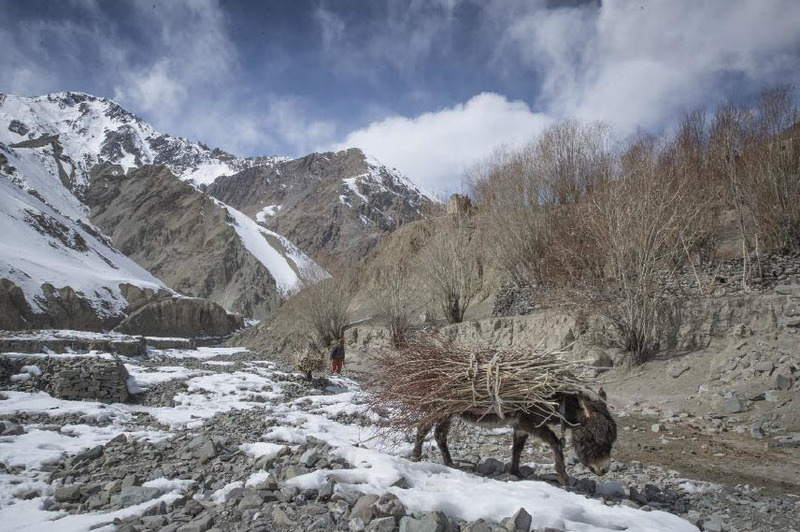 We stopped at our viewing point and alternated between sleeping in the sun and scouring the mountainsides. At about 4pm, when the light was starting to fade and we were considering heading back Nawang spotted a Eurasian lynx! It was just a dot on the snow-covered slopes but we could make out enough of its feline features to realize what it was. Hurriedly we started aiming the rest of the scopes in its direction worried it would disappear. Just as I was about to reposition my scope for our guests I had the strangest feeling and what I can only describe as an energetic tap on the shoulder from behind us. I turned and lifted my binoculars and to my surprise they fell on a magnificent snow leopard sitting in the rocks. It likely had been watching us for the entire day. So, we had a Eurasian lynx in some of the scopes and a snow leopard in the other! This king of the mountain was very generous with his presence as the light dwindled we got to admire him walking across the rocks and higher up into his snowy domain. I would like to thank Phunchok and the amazing staff that we work with, their hospitality and grace was as always, remarkable. I’d like to thank the incredible guests: Jacqui, Jeremy, Craig, Karlien and Lauren… you really made this journey extra special. I hope the memory of that Himalayan air comes to you whenever you need it. This impressive apex predator was seen on most days of the trip. Seen in most villages of the larger villages we passed through. 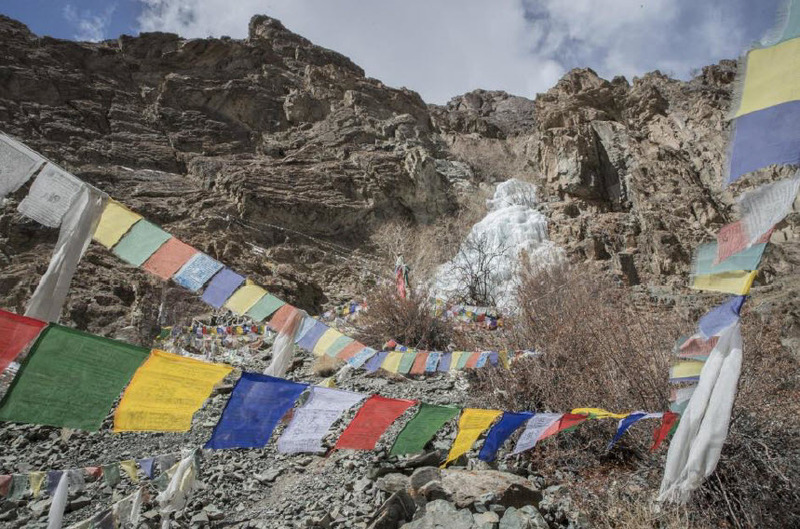 Seen at basecamp and in the small hamlets of Hemis. Seen on most days throughout the trip. A handful of sightings in Hemis. 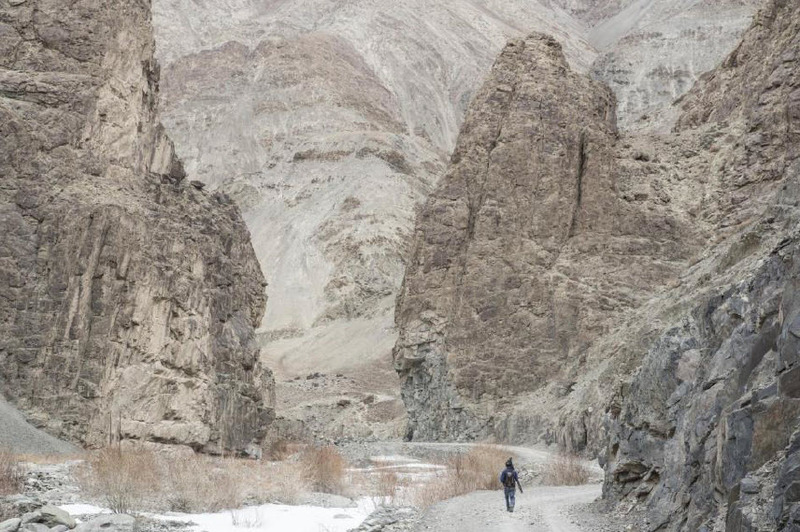 Seen on numerous occasions in the valleys around Leh. Seen in the Rhumbak Valley. 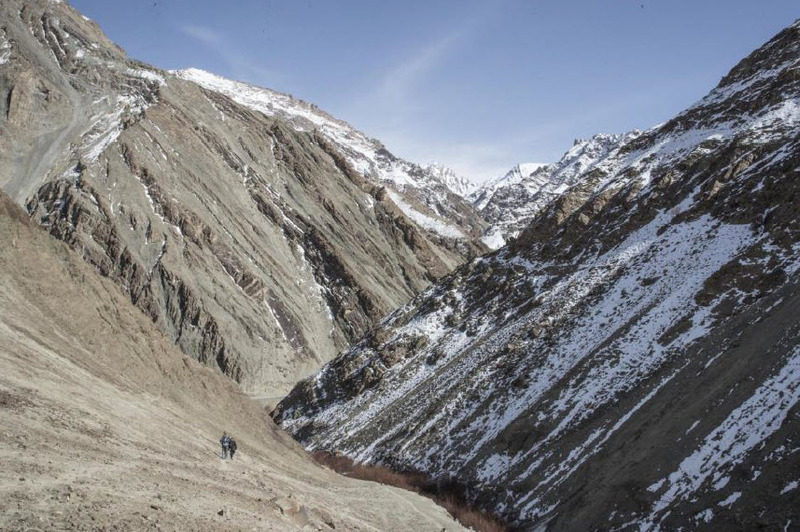 Seen outside Leh along a tributary of the Indus. 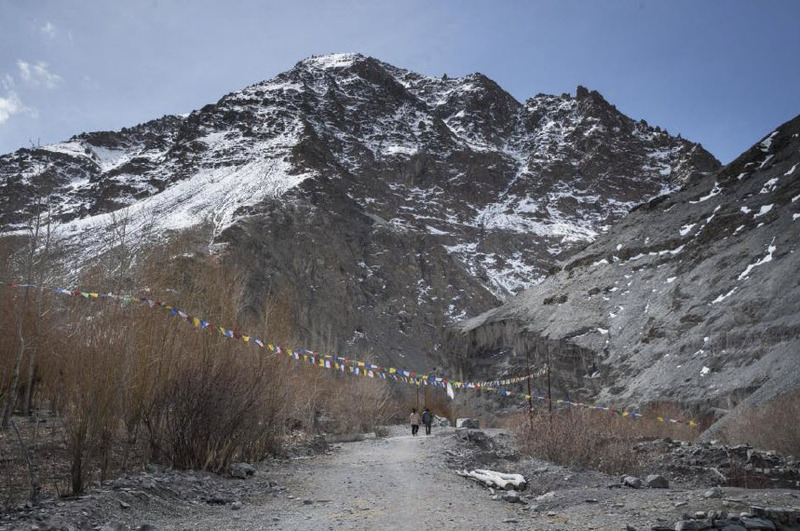 Seen once in Leh, and once briefly near base camp. We saw few hares compared to previous trips, but were able to get a couple of sightings through the scopes. Seen twice around the camp at night, and were alarm calling on one of the evenings. We had a distant view of an individual on or first day, and hour from the hotel. We had a wonderful late evening view of a mother and two sub-adults from our camp on our 5th day in Hemis, apparently the first viewing of these sub-adults. We saw a beautiful individual in the Rhumbak Valley on our last full day. A distant but thrilling view of one in the snowline on our last full day. The most common large mammal: we had a number of excellent sightings of these hardy creatures. 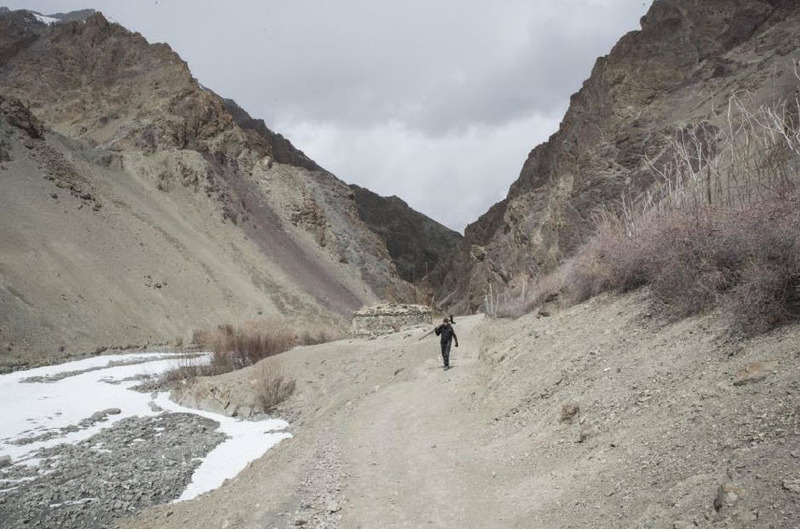 We had two lucky sightings on our way to Hemis.